Season 3 marked a spring-clean and a sharpening-up of Parks and Recreation. Off the back of what was a very funny and much improved second season, the creators didn’t rest on their laurels and the show seemed to evolve even further and luckily even better. Whether it was supposed to be short-term or was always a longer term plan, the addition of Rob Lowe and Adam Scott as Government officials trying to shut down and cut back the Parks Department was a great one. Lowe is crazy and eccentric, with a character who is on the extreme side but never falls into “silly” while Adam Scott’s Ben grows and develops as the season progresses, starting as a clear straight man and then developing some back-story and clear character traits of his own. This is all supported ably by the rest of the returning cast. Amy Poehler is great as always, helming the show as Leslie, while Aubrey Plaza, Chris Pratt and Aziz Ansari flesh their characters out further and add great comedic moments of their own. As with previous seasons, it is Nick Offerman as Ron Swanson who manages to steal the series completely, getting some great moments, particularly when Ron’s ex-wife Tammy returns again. As with any sitcom, the show lives or dies on the episodes week to week and what situations it can place the characters in. Luckily, Season 3 of Parks has a great story-arc which offers plenty of opportunities for funny stories. This includes a Native American curse, the death of a beloved town mascot and a disgusting but successful new drink. As always the episodes start small but plays to the strength of the characters at the middle of the action. It isn’t perfect of course. There are some dud moments and some characters that don’t quite gel. Rashida Jones still feels like a slight weak link but at least gets an interesting story with Rob Lowe’s character which has some clever development. It is also a short season, with only 16 episodes, which plays to it’s strengths in some ways but does mean that you want much more by the time the season ends. 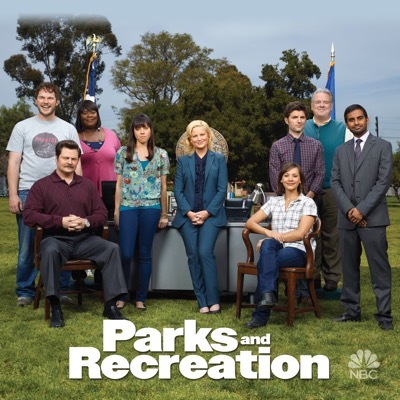 Overall, Parks and Recreations third season is a success. It adds to the already great cast, develops the well-formed characters it already has and plays to it’s strengths, namely Ron Swanson. A short season only means that you want to see even more. Best Episode – Ron and Tammy: Part Two – The transformation of Nick Offerman’s Ron Swanson in this episode is well worth the best episode crown. Should there be another season? – Definitely. This season was too short and the series only just feels like it is starting properly.